We recorded audio commentaries for our first eleven books. You can read along with them on paper or digital editions, the page numbers are the same! 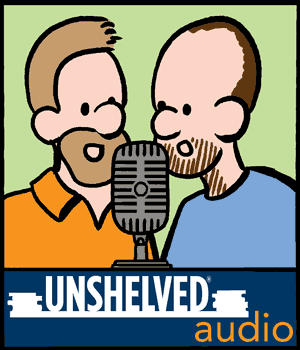 Even if you don't have the book, you'll enjoy Gene and Bill having a good time together, telling stories about libraries and cartooning. We also have a large number of author interviews that we're in the process of reissuing as podcasts. Subscribe to hear them all! Here's a radio interview Bill did about cartooning. Gene and Bill were guests on the Let's Get Busy and Circulating Ideas podcasts.